When we decided it was time to add a puppy to our family we looked at a lot of breeders and decided to go with Varney’s Labs. We absolutely love our puppy, Riggs. He is very smart, easy to train, has a wonderful disposition, and beautiful features; big blocky head, wide shoulders, and a gorgeous chocolate colored coat. 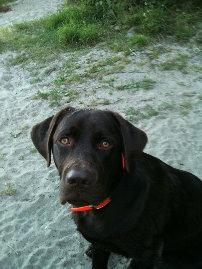 People ask us all the time where we got him because he is such a good looking dog and has a great temperament. We have had Riggs since July 2009 and we absolutely love having him in our family. We would highly recommend one of the Varney’s Labs to anyone looking to add a puppy to their home, especially if you are looking for a lab with an easy temperament and who is good with children. We have 3 little girls and an 11 year old lab, and he is great with all of them. 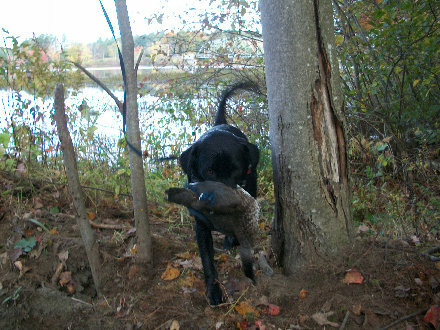 This is Lady with her first Duck! She was born 1/21/2010. Ed Stevens purchased her to be his retirement pup. He picked her up the week he officially retired. They have been constant companions. Ed has been so very pleased with Lady. He sends pictures often and has made comments like "She is a Dream Dog." "Thank you again for letting us have Lady." My name is Kris Samson. My husband Steve and I purchased Baxter from you in early July. We absolutely love this addition to our family! He is so well behaved and is catching on quickly to all training we are doing, including preliminary training for bird hunting. He is fabulous with our daughters, guests and our other pets. We could not be happier!! We brought our beautiful yellow Lab Maggie home the summer of 2010. She is learning new tricks every day. She is a chewer - needs lots of toys constantly. She loves to swim in the lake. She is growing into such a nice dog. She spends her days at work with me and gets tons of love from many different people. One of my colleagues was in law enforcement and he said that Maggie is smart enough to be in the police academy. I told him to get away from my dog - her job is to run in my yard and bark at strangers! We got Zepplin in the Fall. We just adore him and we can't thank you enough for this love of our lives. He loves the water and is happiest with a retrieval toy and any body of water. I knew we would love having him in our lives, but he brings us so much more than we ever expected. He makes us laugh every day and he just fills our hearts with so much love. We thank you so much. Brady our Chocolate Lab just turned 1 year old on 8/12/10. He is an adorable 85 pounds who loves everyone he meets, kids and adults alike and has been able to chew up almost anything he can get his mouth on. Despite the fact that he is a little hyper at times he was wonderfully easy to train. Thank you very much for your help in picking out our dog!